Aspartame is a highly toxic substance found in zero calorie sweeteners like (Splenda, Nutrasweet and Equal), that has been proven to cause major health problems for countless people including cancer, coma and death. Aspartame reduces the level of serotonin in the body and contains no ethanol or pectin, so the methanol is converted to formaldehyde and formic acid. It's believed to cause tumors and hundreds of nerological problems. The FDA has received over 10,000 complaints since 1980 yet it's allowed in over 6,000 products and consumed by millions. When you ingest the toxic chemical aspartame it is absorbed from the intestines and passes immediately to the liver where it is taken inside the liver via the liver filter. The liver then breaks down or metabolizes aspartame to its toxic components (Phenylalanine, Aspartic acid and Methanol). This process requires a lot of energy from the liver which means there will be less energy remaining in the liver cells. This means the liver cells will have less energy for fat burning and metabolism, which will result in fat storing. Excess fat may build up inside the liver cells causing "fatty liver" and when this starts to occur it is extremely difficult to lose weight. Aspartame also causes weight gain by cuausing unstable blood sugar levels, which increases the appetite and causes cravings for sweets and sugar. It is particularly toxic for those with diabetes or epilepsy. It also causes fluid retention giving the body a puffy and bloated appearance. This makes people fatter and increases cellulite. One of the first changes is to stop drinking all diet all sodas and carbonated beverages - including diet soda, which is the worst! Get the Aspartame out of your diet as soon as possible. Diet soda is very acidic, with a pH of 1.5 to 2.5 - that is 100,000 times more acid that your body should have. Aspartame has a pH of 1.5. All life dies at a pH of 4.5! Why is pH so important? If your PH is correct you will have a much less chances of contracting a chronic condition, such as cancer, arthritis or the common cold . Because of this your body creates fat cells to store the extra acid or in this case Aspartame. This is why people who drink diet soda gain more weight and have a hard time loosing weight. 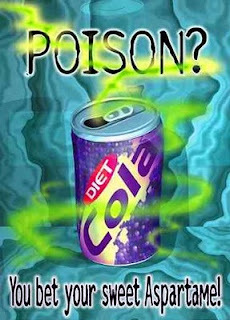 Recovery from Aspartame Disease is a slow process and begins with detoxifying your body of all residual chemical toxins. You can assist your body in ridding toxins naturally by eating a healthy, organic diet, drinking lots of water, taking a daily multi-vitamin and getting regular exercise. Use alternative natural sweeteners like Stevia , a sweet food, not an additive, which helps in the metabolism of sugar. It is ideal for diabetics, has now been approved as a dietary supplement by the FDA For years, the FDA has outlawed this sweet food because of their loyalty to MONSANTO (the creater or Aspartame). So remember, if it says "SUGAR FREE" - DON'T BUY IT! Please take a moment to watch this video about Aspartame.